It’s one of nearly two dozen paths in Zion National Park, but The Narrows manages to stand out from all the others, widely acclaimed as the best hike in America. It’s also among the most strenuous—you’ll need to know what to expect before you enter the canyon for yourself. The Narrows may not be the most imaginative of names, but it’s an accurate one. The trail follows the bottom of the northern part of Zion Canyon, above the point where the walls spread to create the wide-angle photo opportunities famous from Utah postcards. Up here the canyon is usually less than 30 feet wide, and the beauty is reserved for the determined few. There are three ways to hike The Narrows, allowing you to choose your own level of outdoorsy adventure. The easiest way is to just hike upstream from the southern end at the Temple of Sinawava, turning back again when the going gets too rough or you start to get tired. Park regulations dictate that you must turn back before Big Spring, 5 miles up the canyon, however—if you want to see the entire length of The Narrows you have to start at the north end and you need a permit. The park only issues 80 permits per day, so either reserve yours online or show up the day before your hike to obtain it at the Visitor Center. If you like a difficult hike but prefer to take your time, you can also make the north-south journey as an overnight trip, camping at one of 12 sites in The Narrows. As a slot canyon, The Narrows are always at risk of flash flooding, and the park will not issue permits if the river was flowing at a rate of more than 120 cubic feet per second on the previous day. And unlike the paved or at least clearly-marked trails elsewhere in the park, here there is no trail—you’ll be hiking alongside and in the Virgin River itself. Most of the route is not very steep, but you’ll spend most of your time wading over slippery rocks, so wear water shoes and bring two trekking poles. Sometimes you might even have to swim for short distances. It’s a 16-mile hike, but given the terrain it’s hard to do it in less than 13 hours. But if you’re ready for the adventure, the difficulty is definitely justified by the view. You’ll be walking beneath towering canyon walls of brilliant orange, pink and red sandstone, strangely lit by sunlight filtering down from the surface hundreds of feet overhead. Hanging gardens along the canyon further add to the natural beauty, and at one point you’ll climb down past a 20-foot waterfall. 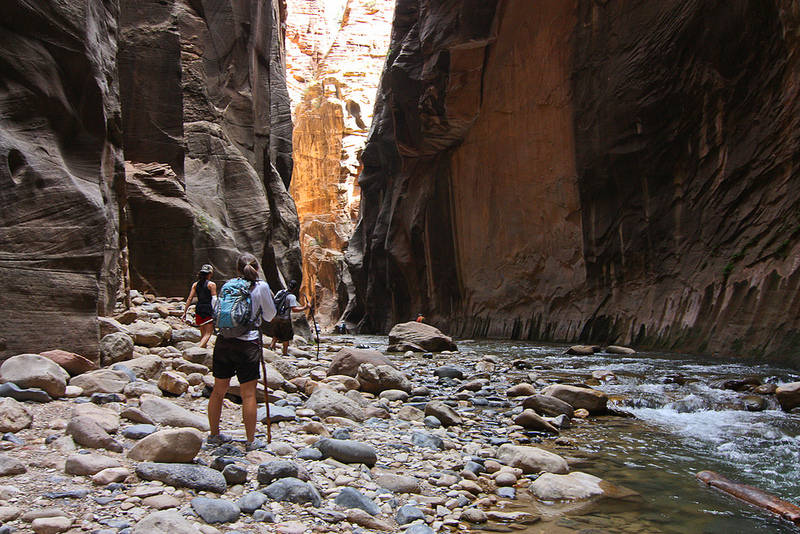 As one of the most classic hikes in the National Park system, The Narrows are not to be missed.